Okay, so I know it is totally not Christmas anymore, but this post is one I didn't get to do at Christmas time so I'm doing it now! Ever need to make multiples of an item you have . . . like 40 of them for a third grade class project? Well I did. As one of the room moms in my son's class, I came up with this ornament for the class to make and take home for parent Christmas gifts (the one above is the one my 3rd grader made). Most of it was paper and cotton. But can I make it easy on myself and make a paper belt buckle? Nooooooo . . . of course not! So, here's what I did. I started with making two single molds. I then made two "rounds" of belt buckles and then made a long brick from my Amazing Mold Putty, pressing all four of those buckles into the putty to create a "multiple mold." I was then set to make six buckles at a time. While 10 minute quick set Amazing Casting Resin is super fast (compared with others which can take 24 hours or more to set-up), can you imagine how long it would have taken to make 40 of these one at a time?!? I, for one, just don't have that sort of time. So this was a perfect solution to my problem. 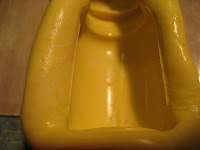 To start, I mixed my Amazing Mold Putty using a 1:1 ratio of "A" and "B" (click on the link at the end of this post to go to their website for a tutorial). Next, I pressed my metal buckle into the single small brick of putty I created. I then mixed my Amazing Casting Resin (use the link above for detailed instructions) - equal parts A and B. As soon as parts A and B are thoroughly mixed you can begin pouring into your mold (It will turn an opaque milky white when it is completely hardened unless you are using clear). 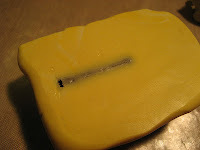 Once it hardened (about ten minutes), I then repeated this process a second time to get my second single buckle mold. Once I had two buckles, I repeated this process another time making two at a time this round. Once I had four buckles, I then make a much larger (longer) mold putty brick and pressed all four of them into that brick to make it a "multiples mold." Take a look at my molds below. Then I began making my 40 belt buckles. Since I certainly didn't want to mess around with trying to paint or color each of these belts in some way after they were made, I simply grabbed my Alumilite Metallic Powder in silver and quickly and easily brushed it into the mold before I poured my resin. The belts popped out already colored as you see in the ornament picture above (a close-up picture is below). What do you think? I think they came out perfect! Amazing Mold Putty is so easy to use that I now make multiple molds even if I am just making a few of something because I am so impatient. I know when I am finished I can put the molds away for another use or I can pass one of the singles on to a friend . . . the gift that keeps on giving. What do you need to make in multiples? I know I say it every post, but I maintain . . . the possibilities are endless. Thanks for checking out this month's project - Make sure to leave a comment and let me know what you think! Also, don't forget to check out the Amazing Mold Putty website for these and more Amazing products. Have you ever cast a mold with Amazing Mold Putty only to realize that you pressed your image down too hard and you have small tear? Well this is an easy way to repair it! 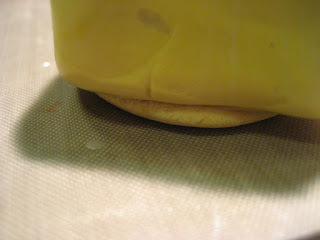 Then smooth it over the back side of the tear. You will also want to press the mold back down (repaired side down) on the table making it even, so that when you add your resin the mold will sit level. 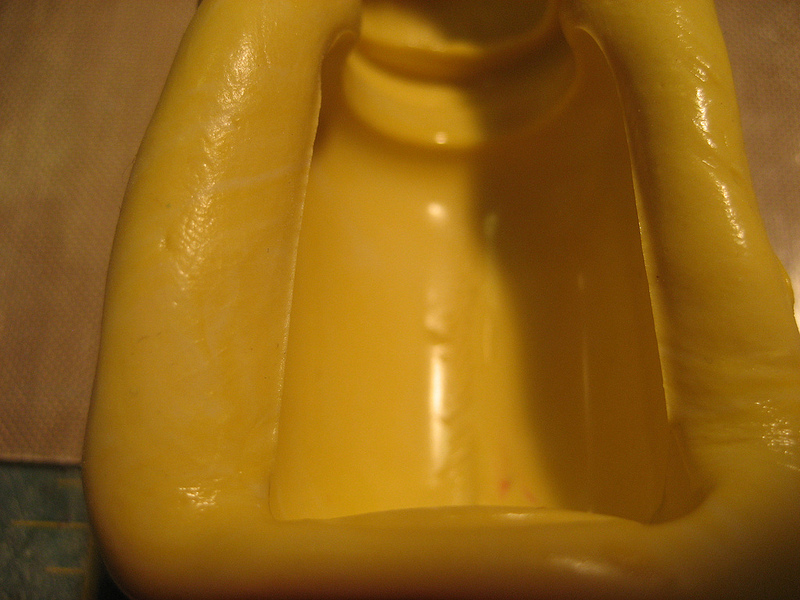 If it is not as smooth on the inside of the mold as a you like, then you can add more mold mixture to the inside. 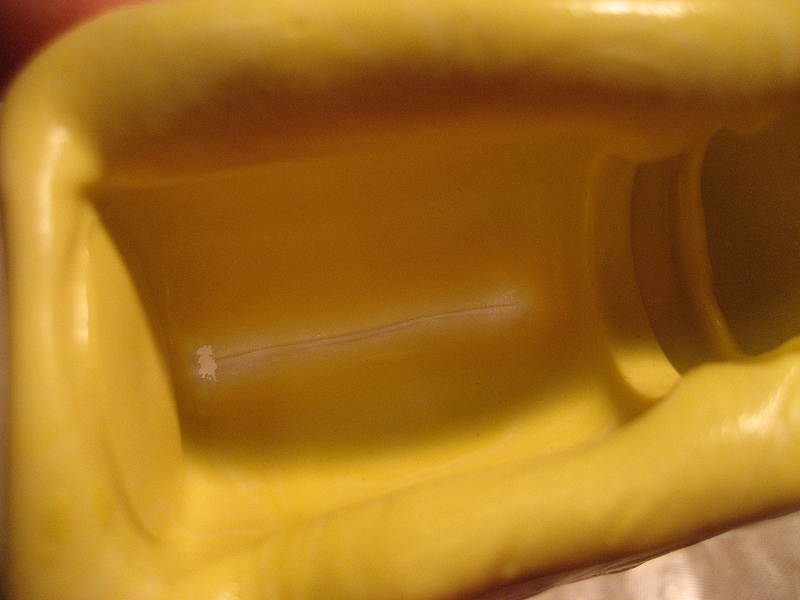 Smooth it out well and I even place my item back in the mold to repair the cast. Now it is as good as new and ready to cast a mold! I have had to do this several times and as long as you blend the putty out thin it will work well on the inside too. As long as you aren't trying to repair a detailed design. I love Amazing Mold Putty and I say it every post. My time on the Design Team is winding down and I am starting to get sad. I love it and I love all the creative uses for it. 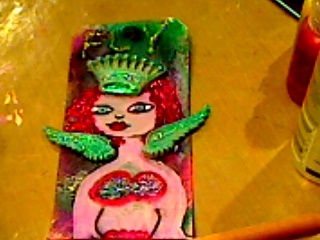 For this month I made a tag for someone as a RAK and used AMP and Resin for the crown and wings. I used Gun Metal Metallic Powder from Alumilite and added a bit of glitter for some detail. 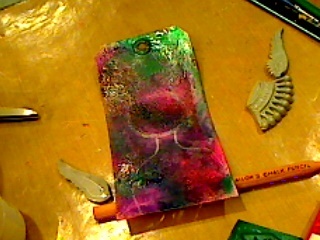 First I inked up the tag with a lot of different inks and paints to make a cool background. Then I drew a quick face and body on it and used a creme color acrylic paint and painted it. I loved the color from the base coming through to the body and face.I mixed my and made my molds and then poured my Resin with a tiny bit of the powder. I added eyes and embelleshments and the word FLY in glitter on top. I left the hole open so it can be hung. I love the way this came out and am so happy with it! Please try this product! The things you can do with are endless! I have this fascination for smaller than life items, loving the mystery of what dwells beyond little doors. I have been wanting my own faerie door for sometime, so I made one, just the way I envisioned, like something from The Hobbit. But then I realized my door needed windows, to make the bottom of our stairs look like some secret home. I crafted the frame of my windows from paper clay. 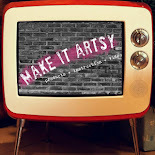 It was a bit flimsy to work with so I recommend you do make yours from some other air dry or oven baked clay. 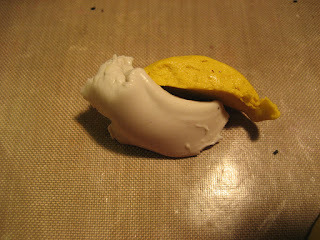 Mix equal amounts of yellow and white Amazing Mold Putty until one solid color of yellow. Make a oval/window shape of the putty and carefully push the clay piece in, making sure to bring the sides of the putty up. Let set, about 15 minutes until putty id firm. Then measure equal amounts of "A" and "B" of Amazing Casting Resin using the cups provided. 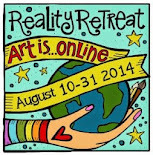 Pour into a small paper cup and mix thoroughly until resin is clear. Fill your window mold carefully. Have extra molds nearby in case you have leftover resin. The above photo shows the clay window in the lower left and the resin window in the lower right. Let resin set about 15 minutes, then carefully push out of the mold. Trim off any abnormalities with small nonstick scissors. 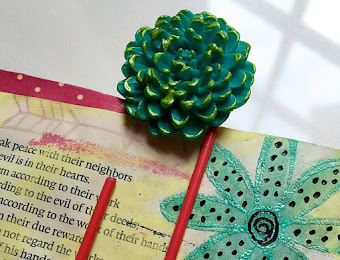 Do this before your pieces fully cures and is still soft and pliable. Then with a dauber, ink up your windows a bit with some brown color. Next spread some clear dimensional glaze over every nook and cranny of your window. Tap a little bit of Copper Alumilite into it's lid then using a old small paintbrush, spread the copper powder onto the window frame. You will be picking up some of the glaze to the point of painting the window frame with a 'copper glaze'. This is a good thing. Touch up the frames with some Gold Alumilite as well. By combining the Alumilite powder with the glaze, you have a built in finish. Cut to shape and glue 2 layers of iridescent cellophane to the backs of the windows. Adhere double stick tape to the windows and place them in a 'low' secretive place for your faerie folk to enjoy! Its that time of year when all of us ladies hope we will receive something special for Valentines Day. But sadly, not all of us will receive the diamonds and bling we desire. So to help you cure your bling bling blues, I'll show you how you can make your very own earrings with a TWIST! - Lay the plastic triangle shape into your mold and let this harden. - Remove the plastic shape. Your mold should look like the one below. 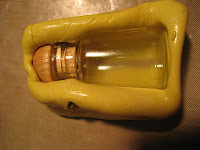 - Pour equal parts of the 5 minute casting resin into seperate containers. - Mix red dye into Part A of the resin and stir well. - Combine the two resins and stir for about 1 minute. - Pour resin into triangle mold. - Pour your resin into your mold and let this set ONLY until it release from the edges. 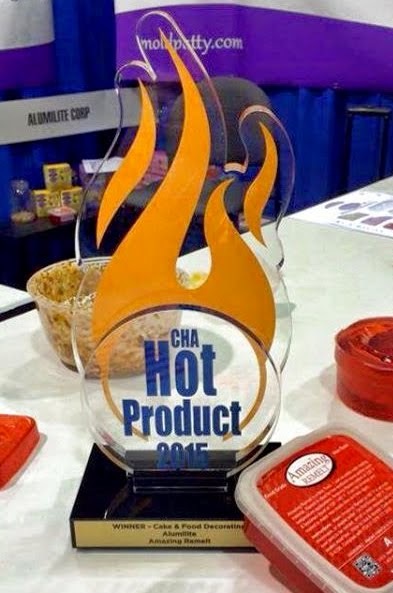 You still want your resin to be pliable, warm to the touch, but NOT sticky. - When you can handle the resin, twist the resin around a narrow pen. 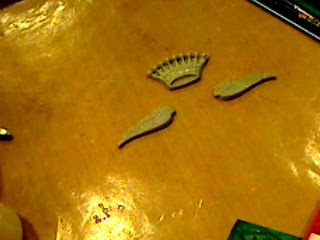 - To complete the earrings you might need to sand off any rough edges. 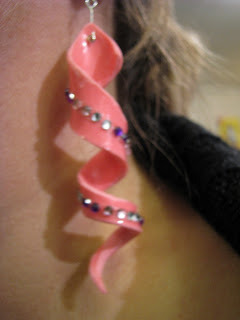 - Drill a hole in the top of the earring to attach your earring loops. Surprisingly, these are light weight and durable. You can make them in any color and would make a GREAT GIFT. I hope you will make a pair of these for yourself. I can't wait to see them everywhere!! I made a card using resin and molds from Amazing Mold Putty! It is a steampunk card! 1. Color Steampunk image with copic markers and adhere to cardstock and card. 2. Make molds out of gears and a bullet. 3. 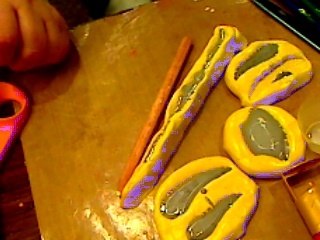 Brush the molds with the metallic powder. 4. Pour resin and let set according to directions. 5. Adhere the pieces to the card and you're done!